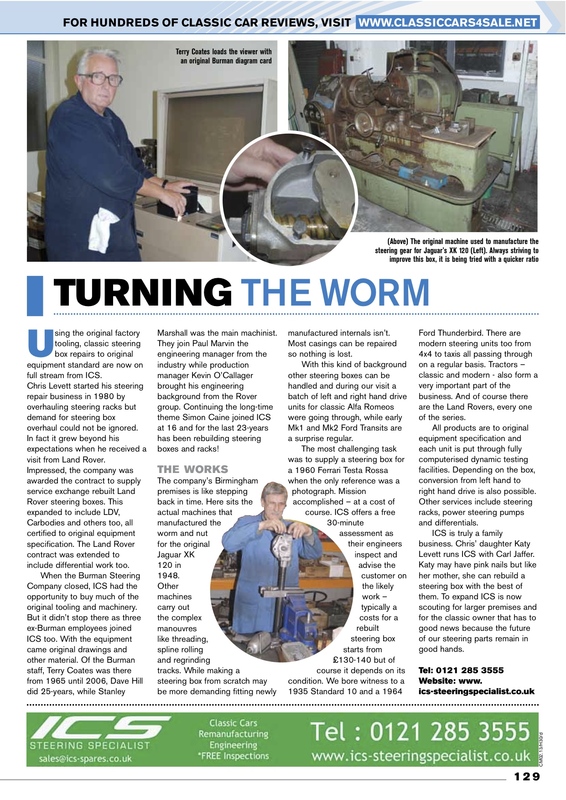 We don't often open up the Engineering Workshops, however we were recently asked by a respected journalist if he could visit and run a story on the expertise and machinery that is still in use today to manufacture and rebuild steering systems to keep cherished and classic cars safe and on the roads today. We were delighted that it received a full page in the Classic Motoring Magazine, that you can read below. ICS already works with a number of Car Clubs, Independent Specialist, Enthusiasts and even Classic Car Racing Teams, but one of the real pleasures for us is ensuring that this 'niche' and critical component expertise reaches readers and owners who thought that their steering would always be deteriorating problem. Look at for some more blogs - we've just completed works of a Concours restoration project and are working on some really exciting solutions.